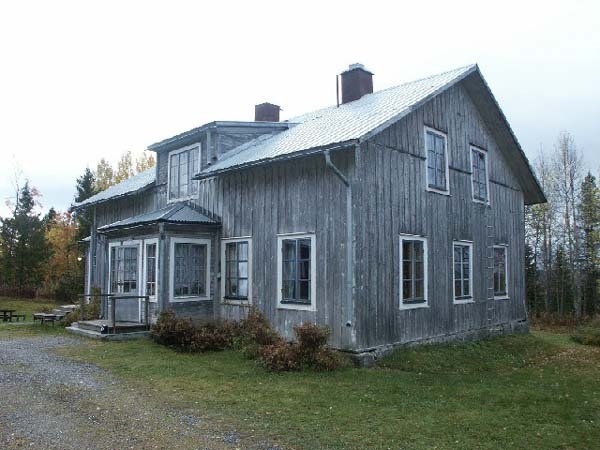 There is an old vicarage located in the small village of Borgvattnet *in Jamtland County in Northern Sweden, it is believed to be one of the countries most haunted houses. Several of the vicars that lived at the vicarage over the years experienced strange activity while living there. It is their accounts that have given the old house such a strong reputation of being haunted. This old vicarage was built in 1876 but it wasn’t until ninety years later in 1927 that the first encounter with a ghost occurred. The chaplain, Nils Hedlund at the time experienced several things he could not explain. One incident involved his laundry. As he made his way to the attic to gather more of his laundry he saw an unseen force outside tearing down his clothes from the line. The next priest to reside at the vicarage in the 1930s was Rudolf Tangden. While he was sitting in one room he spotted an old woman wearing grey appear in a nearby room, he got up to ask what she wanted but as he entered the room she just vanished. Tangden’s successor, Otto Lingren lived in the vicarage in the 1940s. He and his wife heard unexplained sounds and saw objects move. They heard disembodied steps in the hall and also heard music coming from this area. One female visitor, Inga Flodin that stayed in the guestroom was awakened in the middle of the night with a feeling she was being watched. She saw three old women sitting on a sofa against one wall in the room. They all appeared to be crying. She quickly turned on the light and they were still there but now appeared blurry. When she had gone to bed the sofa had not been in the room and when she awoke the next morning it was not there. Erik Lindgren, another chaplain assigned to the vicarage in 1945 recorded several unusual experiences including one that occurred as he moved in. Tired from unpacking he sat in a rocking chair and read a book. Suddenly, this chair tipped forward and he was thrown out. Lindgren stated that when he sat down again he felt a strong force enter his body. 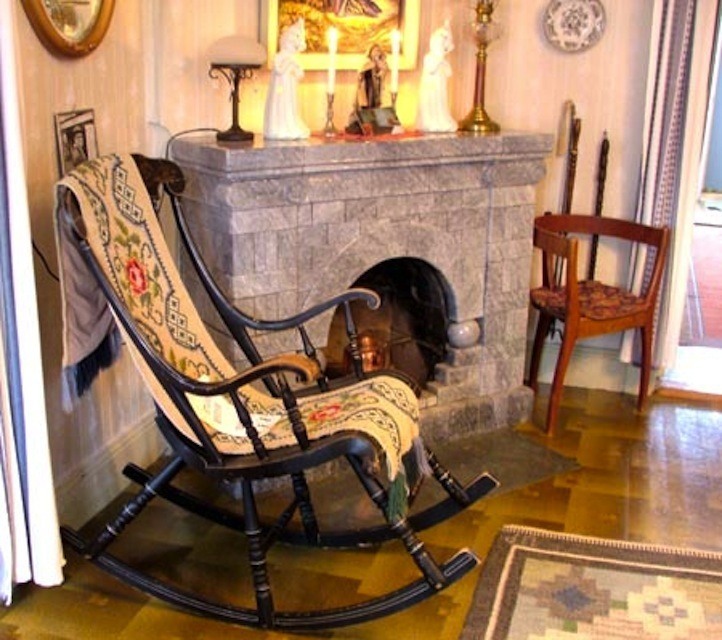 Today this rocking chair is seen rocking on its own. 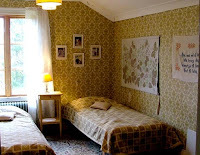 In recent years the vicarage has been used as a small Bed and Breakfast, it is also a restaurant and café. Many of the guests that have stayed here report strange activity. 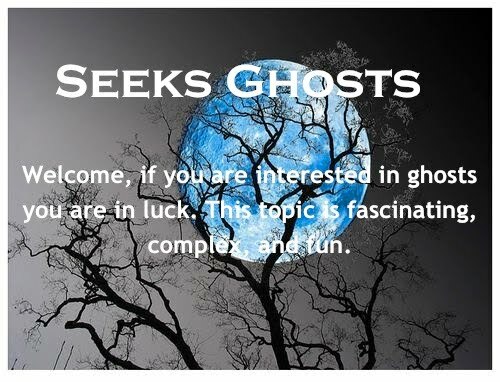 These reports include: shadow people seen, footsteps on the stairs, a woman screaming, someone crying, knocking sounds, and a Madonna seen in one mirror. One couple was making their way down the stairs when an unseen entity grabbed the husband’s arm. He was dragged down the rest of the steps and out into the yard. This couple refused to reenter the house—they slept in a tent on the lawn instead. Several guests have reported being awakened to find an unseen cold hand pressed to their foreheads. Several theories have been put forth as to why the old vicarage is haunted. Many believe it is former vicars that haunt the house others recount stranger stories. One of these involves a maid who worked at the vicarage. She found herself pregnant and out of desperation she killed and buried her baby next to the house. Yet another one told involves one priest, Per Hedlund who lived at the vicarage. His wife Marta died while delivering their 11th child. Per took her body from the morgue and in a strange twist the villagers had to convince him to bury her. It is said when he moved away from the vicarage he dug her body up and took it with him. 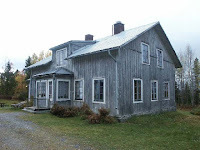 A strange side note to this story is Nils Hedlund who was the first vicar to notice paranormal activity in the house was one of Marta’s sons. 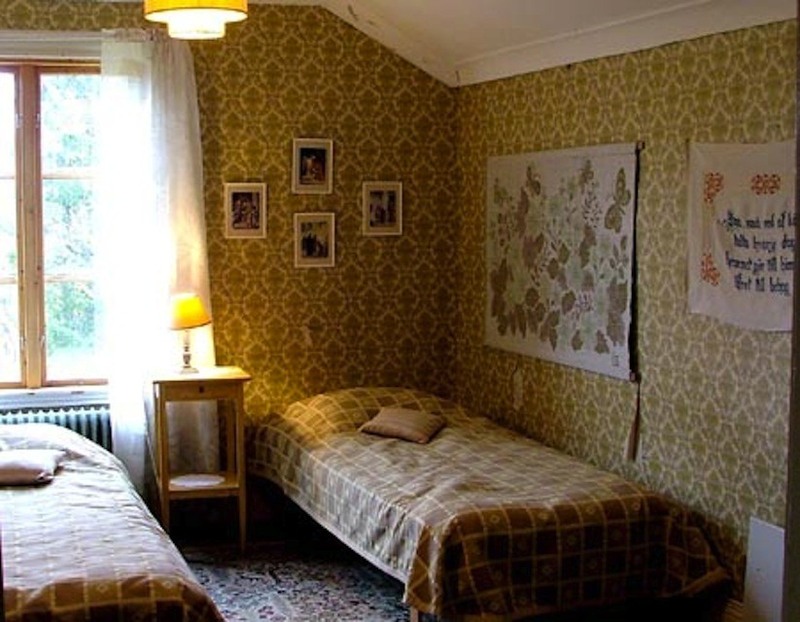 Today, when people are willing to stay the entire night at the old vicarage—Bed and Breakfast--they receive an “overnight-stay-certificate” to honor their bravery and to prove they did it. The following video has many interior shots of the vicarage including the mirror and a video of the rocking chair moving. Sorry, this was not what my research for this post focused upon. I wish you good luck in finding what you need.